At Summit Expedited Logistics, we strive to differentiate ourselves from traditional 3PL firms by combining deep industry experience with preferred partner relationships that add value to everything we do. We believe that providing exceptional service to our customers begins with a healthy and happy work environment for our employees. 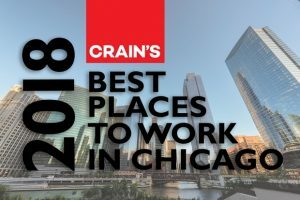 Being named a finalist for Crain’s Best Places to Work in Chicago confirms that SEL is on the right track for future growth. Click here to see the full list of the 2018 finalists. Using detailed surveys to gather feedback from company employees, Crain’s obtains an inside look at an organization based on its workplace, benefits and culture. Summit Expedited Logistics is among the 100 companies with the highest survey scores for 2018. On Thursday (April 12), SEL representatives will attend the Crain’s 2018 Best Places to Work Awards Luncheon where the top companies will be announced.